From the cobbled streets of Lisbon we cycle south through wild coastal landscapes, past fishing villages, pristine coves and superb beaches, to the remote south-westerly corner of Europe. Discover the Costa Vicentina - Europe's largest coastal natural park. Arriving in Lisbon, we settle into our hotel and after an initial briefing with our Explore Leader, there will be the opportunity to head out for our first group dinner. Resting on seven hills overlooking the estuary of the River Tagus, Lisbon became the capital of Portugal after its conquest from the Moors in 1147. As Portugal built a global empire Lisbon became the hub of international trade and the heart of this maritime Golden Age of discovery, reflected in the monumental architecture. A devastating earthquake and resulting tsunami almost totally destroyed the capital in 1755 and therefore Lisbon appears as a carefully planned 18th century city. After breakfast the Tour Leader will lead an orientation walk of Lisbon to help gain your bearings and introduce the city for the day ahead. The rest of the day is left free for you to discover more of Lisbon, perhaps even riding an old-fashioned tram to see the contrasting and characterful neighbourhoods. There is plenty to see and do in Lisbon itself but for those interested this afternoon there is the option of taking a train ride (40 mins) from Lisbon's Rossio Station to hill-top Sintra - the 'Garden of Lisbon' - where royalty and the aristocracy built elegant palaces, estates and gardens, each trying to outdo the other. In the evening you have the option to attend a fado performance - the melancholic melodies of the people of Lisbon or Lisboetas. Today we leave the capital behind and strike south on our journey. After breakfast there will be some time to ensure all are happy with our bikes and to make any minor adjustments. We then begin the first cycling section of the holiday from Lisbon south and ride directly from the hotel through downtown Lisbon and onto Belem district, derived from the Portuguese word for Bethlehem, where we cross the Tagus by ferry. Our route starts with some traffic in the Trafaria area then takes us along the Coast Caparica, sometimes parallel to the sea and other times inland, passing Albufeira Lake until we reach the lighthouse on Cape Espichel where the ride ends. From here we take taxis a short distance to our hotel in Sesimbra. Once a small fishing village, Sesimbra is now a pleasant beach town with great seafood restaurants and an old Moorish fort overlooking the sands. Around 20% of the route today is on an unpaved sandy surface, 80% paved. The Tour Leader will cycle with the group today and tomorrow while the support vehicle transports the luggage. Please note that depending on conditions it may be necessary to walk the bikes over a 2km stretch of sand on today's route. Our total cycling distance today is approximately 59 kilometres (total 550 metres accumulated ascent and 430 metres descent). Today we ride to Setubal passing the rolling hills of the Serra da Arrabida. The stunning coastal scenery is somewhat greener than the south and contrasts the deep blue Atlantic with the greens of the pine-forested hills. There is a steep climb in the morning section of the ride where we gain about 200 metres elevation over 3kms and a couple of shorter climbs in the afternoon. Along the way we pass little bays and beaches and will make time for a quick swim. Finally we reach our hotel in the thriving port town of Setubal where you can take a walk through the pedestrianised old town and even up to the hilltop fortress for panoramic views. Another opportunity to try wonderful fresh seafood with local wines. Around 10% of the route today is on a unpaved surface. Our total cycling distance today is approximately 35 kilometres (total 730 metres accumulated ascent and 720 metres descent). We start the day with a bus ride (1.5hrs) south into the region of Alentejo (literally the land 'beyond' the River Tagus). The second cycling section of the holiday starts in the little coastal town of Sines from where we head south to Vila Nova de Milfontes. Shortly after starting we enter the protected lands of the Vicentine Coast Natural Park - Europe's largest coastal natural park. 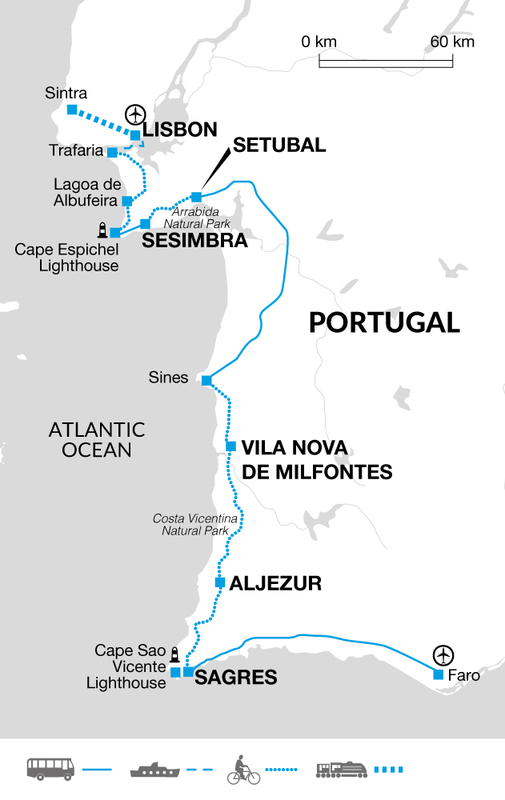 The remainder of the trip is within this huge park as we cycle south until Sagres, mostly on inland routes but always returning occasionally to the stunning coastline of rugged cliffs and miles of unspoilt beaches constantly pounded by the Atlantic Ocean. There is one longer climb today after Odeceixe where we climb for about a mile. Relax in the unhurried town of Vila Nova and take a stroll down to the harbour and explore the old quarter. Around 35% of the route today is on an unpaved surface. From today and for the remaining three days cycling, the Tour Leader will drive the support vehicle, accompanying the ride wherever necessary or possible, providing clear instructions throughout the ride so you can navigate and cycle individually or as a group. Our total cycling distance today is approximately 27 kilometres (total 220 metres accumulated ascent and 230 metres descent). Today is our longest ride as we continue south on another ride past wild coastlines and white-washed fishing villages. The final part of our ride is in the Algarve region, whose name dates back to Moorish time mean simply 'the west' in Arabic. We see the 'untouched' Algarve on the Atlantic Coast, far removed from the golf courses and beach resorts further east. Today's cycle ride ends in in the charming historical village of Aljezur. We recommend a stroll around its compact and well-preserved old quarter and, time permitting; you can choose to visit the ruins of the medieval castle with great views over the surrounding area. Around 15% of the route today is on a unpaved surface. Our total cycling distance today is approximately 66 kilometres (total 650 metres accumulated ascent and descent). Our final ride passes some of the greatest wild beaches on the west coast on our route to the lighthouse at Cabo Sao Vicente - the most south-westerly point of continental Europe. There is one steady and gentle uphill at the beginning of the ride, then another couple later in the day. Our final destination is the historically important port town of Sagres. It was here that Prince Henry the Navigator founded his navigation school during the 'Age of the Discoveries' and the Fortaleza de Sagres castle, rebuilt in the 18th century. Modern day Sagres is a small tranquil town with a picturesque harbour and several nearby beaches. Within a short walking distance of our hotel is a choice of local restaurants and bars to celebrate the end of our ride. Around 8 km of the route today is on a slightly rougher, unpaved surface. Our total cycling distance today is approximately 61 kilometres (total 760 metres accumulated ascent and 730 metres descent). Our trip ends this morning at Faro airport, just one hour and twenty minutes by bus from Sagres. When cycling: quick drying cycle tops, padded cycle shorts, lightweight wind and water proof jacket and warmer breathable layers where local conditions require. Be prepared for wind from the Atlantic in general and some colder days on the bike on departures in April, May and October. 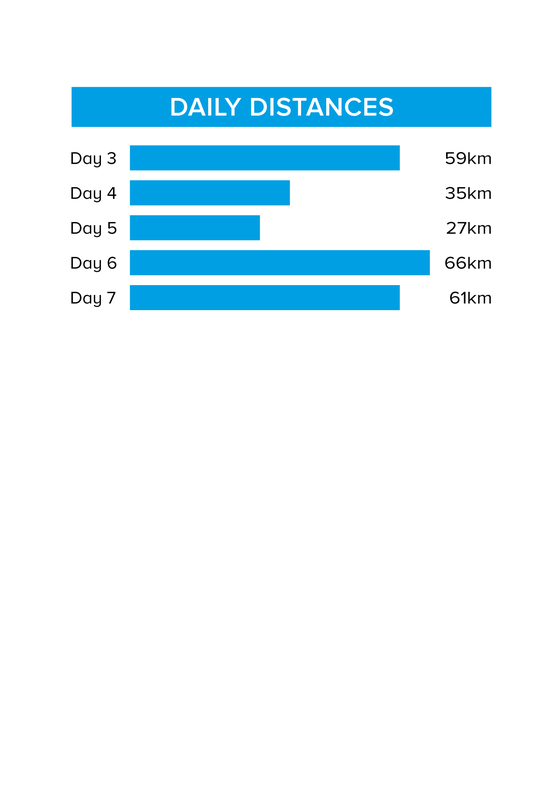 On this tour we cycle 248 km over five days (an average of 50 km per day). We cycle on a mixture of tarmac roads with traffic, cycle paths and off-road routes. The cycle rides are not accompanied by a cycle guide, except on days 3 and 4 when the Tour Leader will cycle with the group. On the other days the Tour Leader drives the support vehicle, accompanying the ride wherever necessary or possible, and provides clear instructions throughout the ride so you can cycle individually or as a group. Each day a support vehicle carries the luggage from point to point. We have graded the route as moderate. 27 gear Stevens Galant or similar hybrid bikes.